← Let there be sung Non Nobis and Te Deum! Well, we are having fun. We are currently several days into what I can only describe as a “pilgrimage” to the Land of My Fathers, the Good SA of A, the Austral part of Terra Australis, the Great South Land, aka “South Australia”. Founded n 1836, my ancestors arrived here at the end of 1838 and got very busy establishing Hahndorf, the Barossa Valley, the Lutheran Church in Australia, and Fritz. None of them were in the wine business, but my great-grandfather did work for 18 years as a carter for Seppelts. Does that count? First stop on the pilgrimage is Casa Pearce. 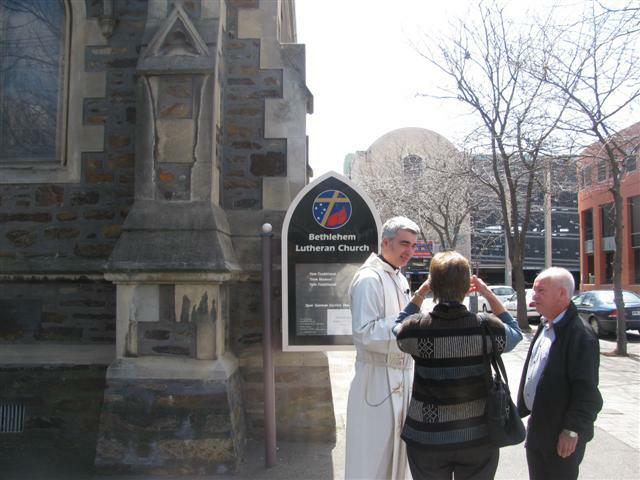 The inestimable Pastor Fraser is now the Pastor of Bethlehem Lutheran Church, Flinders Street in the city. 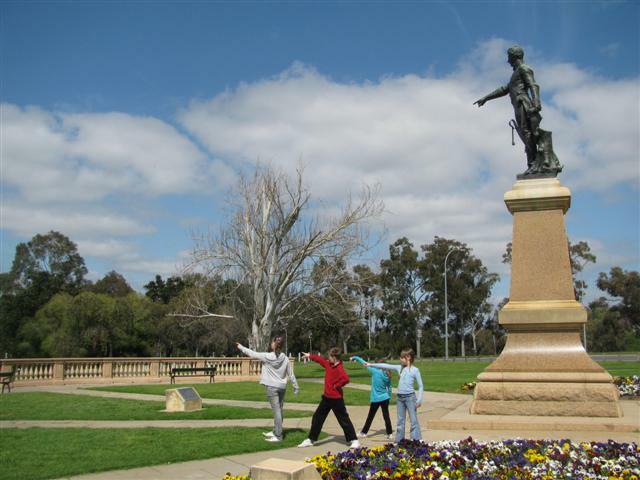 Bethlehem is celebrating its 150 anniversary next weekend and is the premier Lutheran parish in Adelaide (members of St Stephens, Flinders Street, may disagree…). 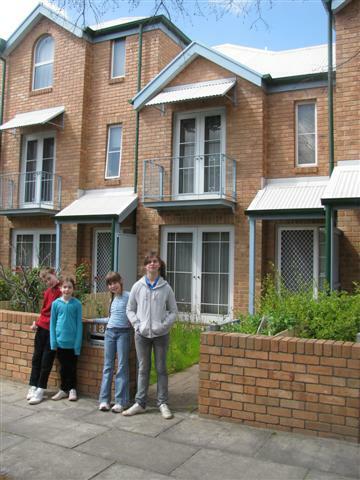 Fraser and his family live in Burnside, a suburb at the feet of the Adelaide Hills. Burnside was settled in 1839, so is one of the oldest areas of town. Despite being a good distance from his ecclesial seat, Adelaide traffic being what it is (or isn’t) he really isn’t more than ten minutes away from his office in town. It is very beautiful here. Spring has come, and the fragrance of the blossums is everywhere. Yesterday – the day of the fateful “hung Grand Final” (another story that I won’t go into just here – let’s just say, when I heard the result I laughed and laughed and laughed!) – I tried to escape from all things football by suggesting to my daughters and Fraser’s two eldest, Oscar and Francesca, that we all go into town. The itinerary was a simple one. 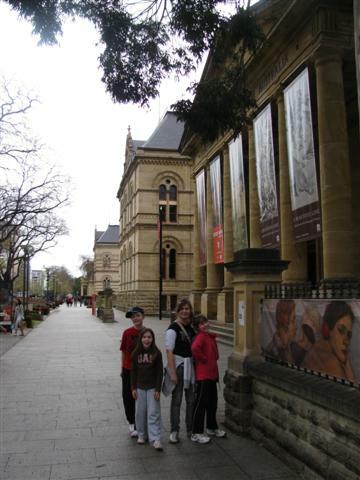 We start at the Uni SA end of North Terrace (where Dad learned how to be a librarian), wander on down westwards past, around and through the University of Adelaide (Dad learnt Classics in that building, and History in that building, and Latin in the attic of that building), popped into both the Art Gallery and the Museum (both FREE!!! – a blessing when towing along four kids), past the State Library, Government House and Parliament House, then we did a u-ey (we had a discussion in the car the other day about exactly how to spell that word: you-ee, ew-ey, yewee…) and headed back east through Rundle Mall so the kids could look into all the shops. 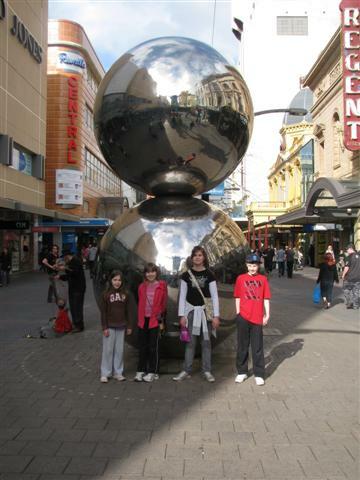 The traditional Rundle Mall shot! On our way over here on Friday, we passed a number of vintage and veteran cars heading toward Adelaide, enough to make me wonder whether this might not be the one weekend every two years in which the famed “Bay to Birdwood” rally takes place. 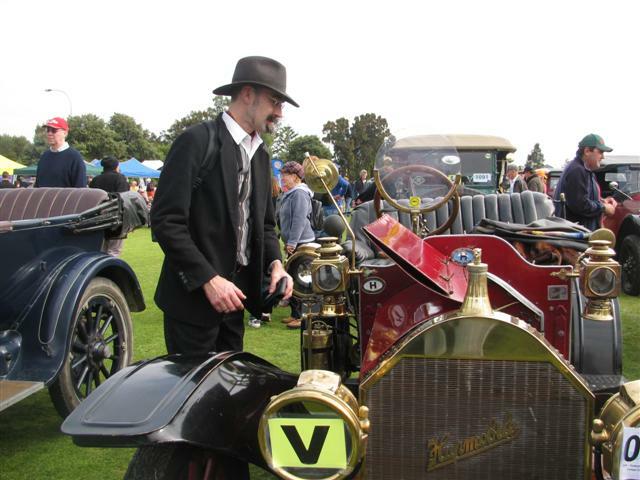 My father had taken me and my three brothers to the first “Bay to Birdwood” rally in 1980, and in the years that followed I actually rode in the rally several times with friends who had a 1928 Tudor Model A Ford and a 1913 Australian built Model T. I have always had a great love for these old vehicles – they were built at a time where beauty was an important part of design. Any way, a quick check of the internet on my Palm Treo told me that this weekend was indeed the B2B rally, the cars being due to leave West Beach at 9am on Sunday morning. 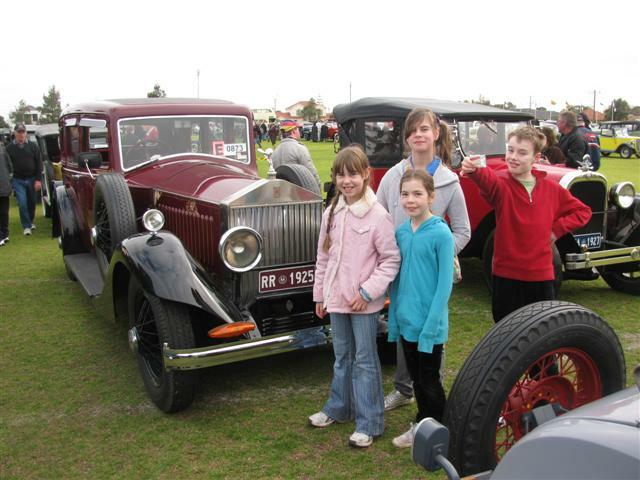 Here was a chance to introduce my children to the joys of vintage and veteran motoring. 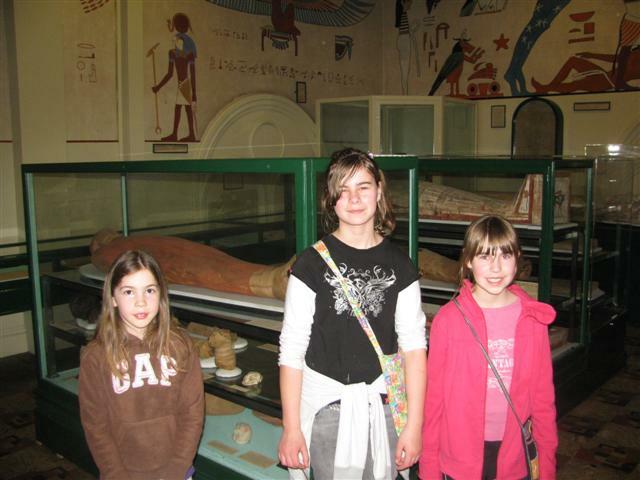 They were keen, and Fraser’s two eldest were up for another expedition, so we were off from home this morning at 7am. 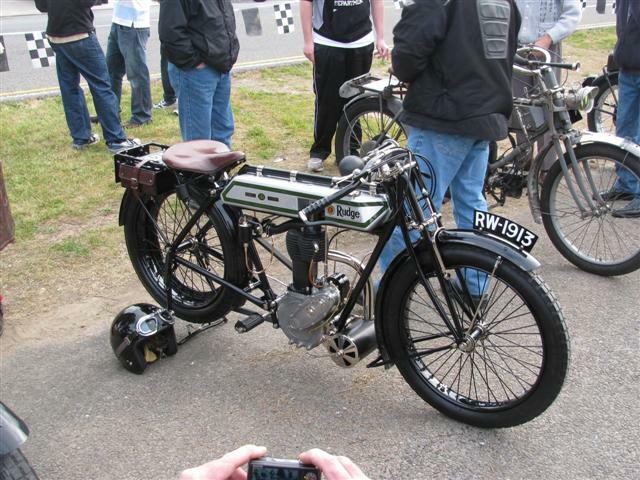 There were about 1500 cars lined up ready to go at Barrett Reserve when we arrived, and we spent a very enjoyable couple of hours wandering around looking at the cars (and motor cycles – those old veteran bikes were made for the days when motorbike riders were REAL motorbike riders!) and talking to their owners before the rally set off at 9am. 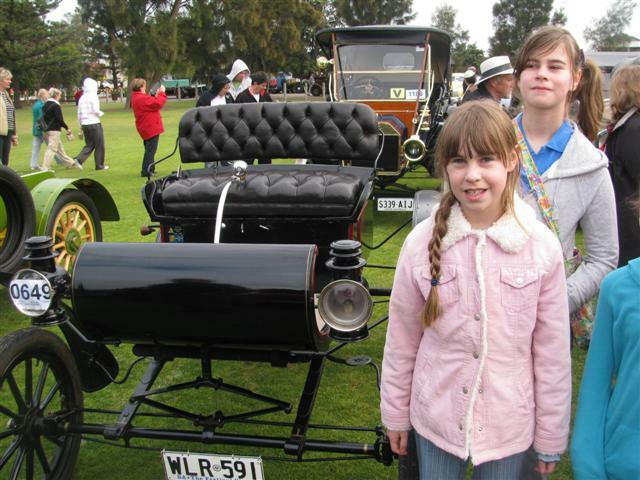 Maddy and Mia at the Bay to Birdwood start with their new car! The children with MY new car! We were due at Bethlehem for the 11am service this morning, so we had a few more hours to kill. Next step on the Pilgrimage then: Immanuel College, the old Alma Mater in Novar Gardens. This is where Dad lived for two years during his final years of schooling in 1982-3. It was just as I remembered it, only completely different. The place had sprouted buildings like mushrooms. 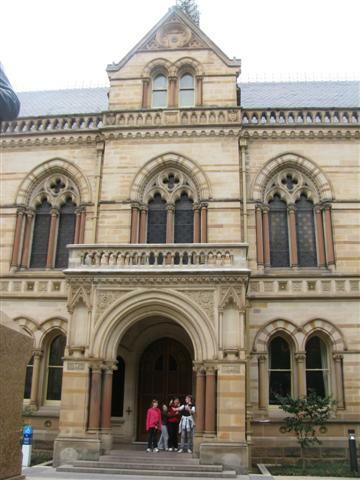 In the place of the open wide lawns, there were now laboratories, tech rooms, concert halls, etc etc. There was a service going on in the chapel, nevertheless we got to take a look at the good displays of the history of the College. Basically Immanuel has four phases: First phase was at Point Pass, the town where my Schütz ancestors settled north of the Barossa. My Grandfather was a farmer, and his father had no intention of sending him to the local college. The College then shifted from these back blocks into Adelaide, to the site and building that became (eventually) Luther Seminary, where I lived and trained for nine years. Then it shifted to Walkerville, to an old mansion that doesn’t exist any more. My father went to Immanuel at that campus in its last years. Then the campus shifted to Novar Gardens, where my mother was a student in its opening years. 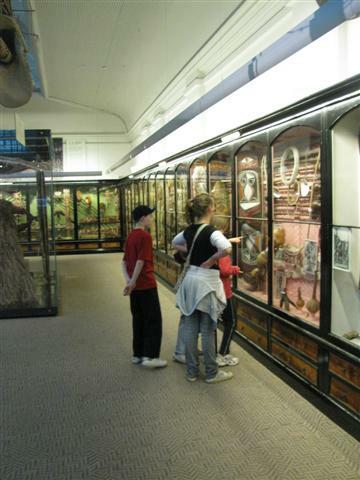 So in a way, we have had a connection with the college at all its stages. Still with a bit of time up our sleeves, I thought we could pop out to Luther Seminary itself, now rather cheaply named “Australian Lutheran College”. Here I was able to show the kids the three locations on campus where I lived (both as a single and a married student), the pub where I had my first legal drink, the pine tree in Wellington Square up which I had my 18th birthday party, and the Library where I famously never became Librarian (despite being trained by the Lutheran Church as a librarian for that very purpose). The kids under the bell outside the chapel at Immanuel College Novar Gardens. I was a student here in 1982-1983. My mother was a student at the college when it first opened at this address, but my father had attended Immanuel at the Walkerville Campus. 104 Jeffcott Street. Built as Whinham College originally, it became Immanuel College after the shift from Point Pass, and then the Seminary of the UELCA. 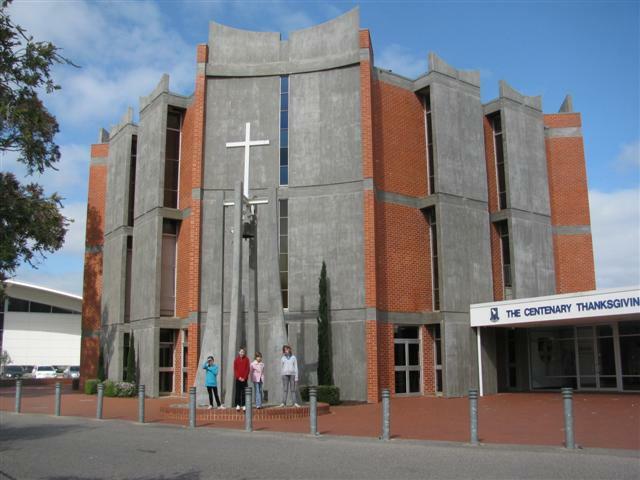 Since 1966 it has been the Seminary of the LCA (now known as Australian Lutheran College). I was a student here from 1984 to 1992. 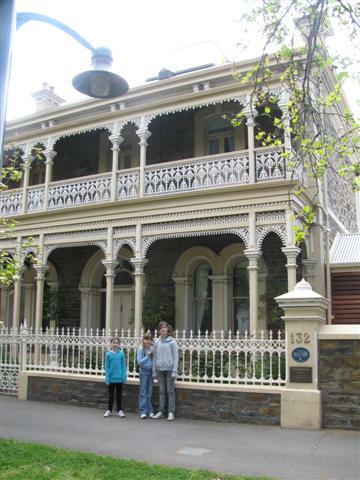 Francesca, Mia and Maddy in front of 132 Jeffcott Street, North Adelaide. Now in private hands, my wife and I lived in the bottom righthand half from 1987 to 1989 when it was used as accomodation for married Seminarians. It was also the boarding house for girls when 104 Jeffcott Street was Immanuel College, and served as the Seminary during the war years when 104 Jeffcott Street was taken over by the military. 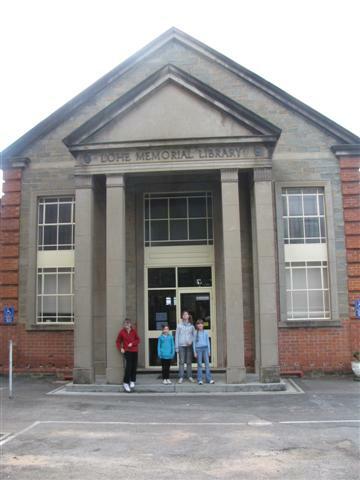 Oscar, Cesca, Maddy and Mia in front of the Löhe Memorial Library. The LCA trained me as a Librarian with a view to future staffing for this library - it never happened. Then it was down to Flinders Street for the 11am service, the “bongos and banjos” service. No, seriously, it was just flute, piano and bass guitar, but if I wanted the organ I had to come back at 7pm that night. Assistant Pastor Matthias preached (they were celebrating St Michael’s Day – a few days ahead of time – in the attempt to ensure that the holy days are at least observed Lutherans tend to transfer them from weekdays TO the Sunday, whereas, to preserve the Lord’s Day, we do the opposite), and the girls got to go to communion. 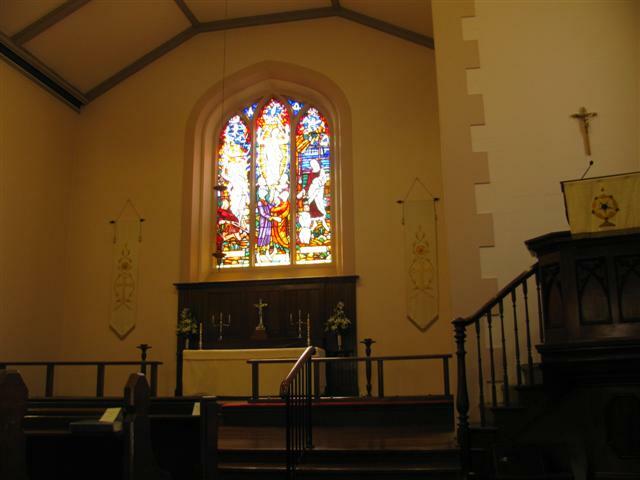 The interior of Bethlehem Lutheran Church in Flinders Street Adelaide. Note the sanctuary lamp - truly unique among Australian Lutheran churches. I knew I would have to fit in Mass sometime today, so Fraser kindly offered to take me to the local Latin Mass parish for their 5pm Low Mass. I will discuss my impressions of this at a later point, but it was a good opportunity, and the first time since becoming Catholic that I had received communion kneeling at an altar rail rather than in a processional queue. Then we were off to Bethlehem for the 7pm Eucharist. This time we got the organ. 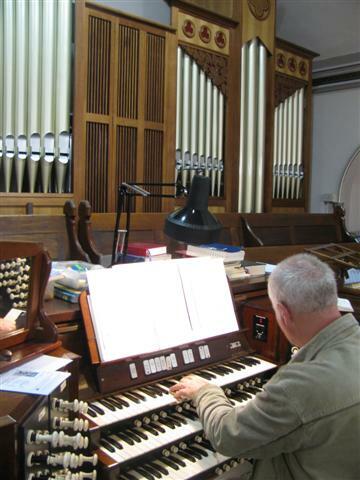 In fact, the organ has just been refurbished at a hideous but necessary expense. The organist for the evening was Andrew Ampt, and he did a superb job. We had “Wachet Auf” (the third verse is all about Angels joining with men in worship), “Jerusalem the Golden”, and “Stars of the Morning” as hymns. The service was the traditional chanted communion liturgy. Very nice. Only my voice was running out. The only thing I can put that down too was herding the children this morning, and spending all afternoon talking with Fraser! All in all, a very very good start to our pilgrimage. 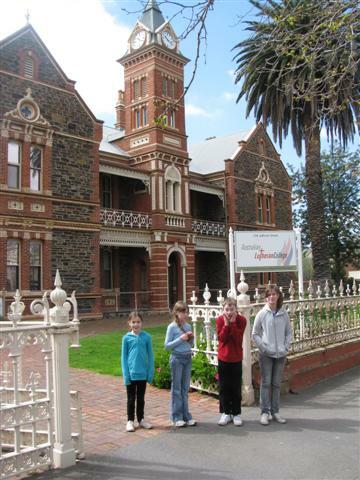 Tomorrow we set off for the Barossa Valley, although the kids have already booked me up to walk them up the kilometre or so of bush walk along the local creek. I AM having fun! And Cathy is too. She said that the one thing she wanted to do was sit and relax these holidays, and, given that I have had the kids with me most of the time, she has had the chance to do that. My cousins attended Immanuel College in the 80’s and 90’s ,and one of them,so I was told by his uncle-ended up being drummer for Guy Sebastian. Adelaide is ‘squeezed’ by the hills, Matthias, so the trip you took was — once you got to the Eastern perimiter of the city — one of it’s narrowest parts. Try going from Pt Noarlunga to Gawler at any time of day and the 30min myth might get tested! You are much gentler on Adelaide than Malcolm King in Eureka Street, David! I’ve been a volunteer at Mary Potter Hospice for over a decade now, so I often pass by that imposing Lutheran Seminary. It’s nice to know a bit about it. There are some parts of Adelaide i would avoid- but then there are parts of Melbourne I would avoid as well. and I have travelled from Glenelg to Glenelg via Pt Noarlunga and Victor Harbourand if the Southern Expressway was not built it would have been a tedious trip. Ah … Victor Harbor … affectionally known as ‘God’s Waiting Room’. I did get that impression but when i was there inAugust 2009 ,I thought my wife and I had happened upon a large mass holiday of young pregnant women and their husbands/partners having one last long weekend BC-Before Children,whilst my wife and I were there in our AD phase -.19 years After Delivery of our youngest.And our first weekend away . Having just read King’s piece in Eureka Street, Tony, I can’t say that I entirely disagree with it. Yet it is still a city with a lot of charm, and as Dorothy would say “there’s no place like home”. It’s a little like the Curate’s egg, David. The good parts don’t redeem the whole. For example, King’s headline is ‘Protestant righteousness in ‘weird’ Adelaide’ which may lead the reader to think these themes might be developed, but they hardly rate a mention. He talks about the impact of the State Bank collapse as if it was unique to SA — remember ‘WA Inc’? — and if it was still happening. The part that is true is that it did have a big impact, the part that isn’t is that it’s still having an impact. Our LCMS church in the States and other LCMS churches that we visited traveling across had sanctuary lamps. That may be the influence, Harry. Two previous pastors of Bethlehem have had strong LCMS links, one of them an Englishman and the other the well known Pastor Harry Wendt. 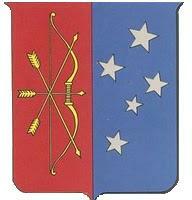 Actually, David, even before Prs Simms and Wendt there was a Missouri influence at Bethlehem. Pr Dorsch (pastor c. 1888-1900) was German-born but St Louis trained, and Pr Janzow (pastor c. 1907-1945) was American-born and St Louis trained. It would be interesting to find out just when the sanctury lamp was installed. Perhaps Fraser could find out? Ah, Adelaide in spring…bleak one day, absolutely miserable the next! If they _had_ made you librarian of Loehe, do you think you’d still be Lutheran, David? Yes, the name change to Australian Lutheran College showed complete disregard for history and tradition. I believe it was done because teachers getting theological diplomas and degrees from the sem didn’t like their parchments having the word “seminary” on them. Probably, but in a different way and by a different path. I was certainly leaning toward the Catholic Church already at Seminary. It would just have been a question of what “tipped” the balance. Still, one can’t play the “what-if” game with any profit. I agree about the “what if” game. I was just wondering about how different things may have been if you’d stayed in the Lutheran mecca – you certainly would have been an adornment to Loehe library! 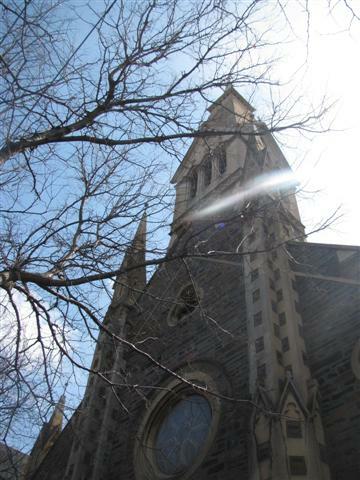 Bethlehem Lutheran Church of Adelaide? Now I’m really curious. I found an old newspaper clipping among my mom’s photo albums showing our arrival in Adelaide in the early 1950’s (turns out I had it reversed, first we went to Adelaide then to Mildura). My mom is shaking hands with the Lutheran pastor who is welcoming a group of German immigrants to “The Lutheran Church of Adelaide.” I couldn’t make out his name, unfortunately and regrettably I can’t ask my mom either, as she now has Alzeheimer’s. Can anyone give me a general idea of how many Lutheran churches there were in Adelaide between 1954-1958? I’d be very interested to see that photo; could you possibly scan it and send it to me via my e-mail address, see ‘Glosses From An Old Manse’? I may be able to identify the pastor. It is most likely Pastor Alfred Zinnbauer (1910-1978), a refugee from 1930s Germany, of German-Jewish extraction, who did some truly saintly work among German migrants in Adelaide in the 1950s. The photo may also enable me to identify the church. Just saw this, I would be happy to send a copy of the photo. It is a very old black and white, perhaps you will be able to make out the Pastor’s name. I’ll fish it out of my mom’s photo album this evening. Actually, so do many ELCA churches here in the States but the lamp is often suspended before the pulpit to emphasize the presence of Christ in the Word of God.